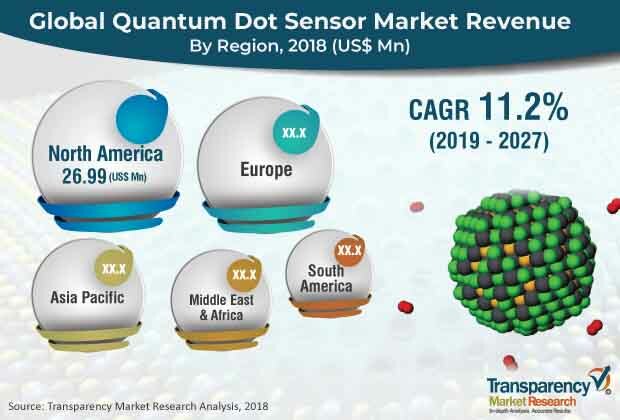 According to a new research report on the quantum dot sensor market, published by Transparency Market Research the global quantum dot sensor market is expected to reach value of US$ 195.4 Mn by 2027, expanding at a CAGR of 11.2% from 2019 to 2027. Asia Pacific is likely to continue to lead the global market, with the market in the region expanding at a CAGR of 12.4% between 2019 and 2027. The quantum dot technology has advanced to a new generation of high-definition technology, paving the way for more energy-efficient consumer electronics devices such as digital cameras, smartphones, and biological sensors. Also, manufacturers such as 3M have used the quantum dot technology in quantum dot enhancement films (QDEFs), with which the company can make devices, such as tablets, smartphones, and televisions, brighter, lighter, and more energy-efficient. The global quantum dot sensor market has been broadly segmented in terms of application, end-use industry, and region. In terms of application, the market has been classified into smartphones & laptops, digital cameras, surveillance cameras, medical imaging devices, and others. The smartphones & laptops segment is expected to register the maximum CAGR, in terms of revenue, during the forecast period. This is primarily due to high use of imaging sensors in smartphones and laptops. Rising need for high-quality images with high quantum efficiency contributes to growth of the smartphones & laptops application segment. Increasing need for broader and more efficient infrastructure and improved monitoring of infrastructure for predictive and corrective maintenance is driving the market. Based on end-use industry, the quantum dot sensor market has been divided into aerospace & defense, consumer electronics, healthcare, and others. In terms of revenue, the consumer electronics segment holds the leading market share and the trend is anticipated to continue during the forecast period. The segment is projected to register the highest CAGR of 11.4% between 2019 and 2027. This is primarily due to growing usage of consumer electronics devices such as smartphones, cameras, and laptops. Based on region, the global quantum dot sensor market has been segmented into North America, Europe, Asia Pacific, Middle East & Africa, and South America. Asia Pacific dominated the global market in 2018. The market in the region is estimated to expand at a CAGR of 12.4% during the forecast period. Demand for quantum dot sensors in Asia Pacific is likely to remain concentrated in China and Taiwan, owing to the wide consumer base and presence of a large number of providers of consumer electronics devices in these countries. The market in China is estimated to expand at the maximum CAGR among countries in Asia Pacific during the forecast period, owing to growing popularity of electronics devices and rising adoption of advanced technologies in the country. Most countries in the region still use silicon-based image sensors, but they are expected to shift toward quantum dot sensors. North America held a major share of the global quantum dot sensor market in 2018. This can be attributed to extensive facilities of various companies for the development and manufacture of products for use in aerospace & defense and consumer electronics sectors. InVisage Technologies Inc. is the only key player operating in the global quantum dot sensor market. The research study includes a profile of this company. The company has been profiled in terms of attributes such as company overview, financial overview, business strategies, and recent developments. InVisage Technologies Inc. is focusing on expanding its business through acquisitions and strategic partnerships. Improvement in machine learning models and financial risk assessment, rise in the efficiency of chemical catalysts, and discovery of new medications are expected in the near future.